We live in the age of social media, to the point that it's becoming faintly ridiculous. I have a love hate relationship with social media. I spend far too much time on Facebook... and I was absolutely never going to ever join Twitter. But of course, I realised it was an excellent place to connect with other people who might be interested in my blog, and now I'm a regular little tweeter. But Pinterest? Well, that seemed one reserved for the fashion and food writers, the wedding planners, and the DIY fanatics. 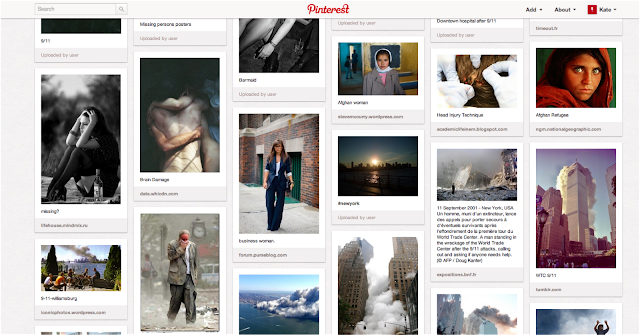 For those unfamiliar, Pinterest acts as a mood board of images. Now, I have no real interest in following others' pages on Pinterest, but it got me thinking, can this be used as a means of inspiration? When writing, I quite often like to search for images that evoke the place, time, or event that I'm writing about. I've long toyed with the idea of having an actual pinboard of images, and perhaps in the future (when I move house) there may be space for this. But it's far more environmentally friendly to create a digital space for these images. I have my first board called Novel Ideas, and it has zero followers. I don't blame people really; it's full of images of post-9/11 New York City, sad looking business women, head injuries, and the Afghan countryside. But for me, this is perfect. I can look at this assortment of images on one page and get a sense of the atmosphere I want to create. I already mentioned that I respond well to visual writing prompts, so this is the logical next step. Ideally, I'd be able to set the board to private (as far as I know this isn't possible), but I doubt anyone but me is going to be terribly interested in this. I'm sure I can't be the only writer out there who uses Pinterest in this way... I'm thinking it could be a good way of story-boarding my novel as I get a bit further along with it. What do you think? Is this yet another distraction from writing, from living? Or can you see a use for Pinterest and other social media?